Whenever we go for grocery shopping, we come across this cluster beans/Indian beans/Kothavarangai, but will be highly hesitant to buy because of its price. Yes, it is costly! at least in our Chicago area. Though we both do not have that much love for kothavarangai/cluster beans/Indian beans, this time I decided to try it out. 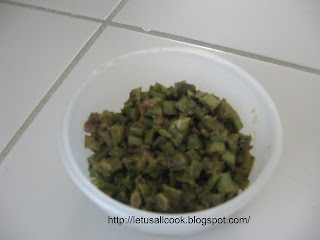 Now, I was in a dilemma whether to cook this kothavarangai either as poriyal or as kootu. Both can be used as side dish. However, I remembered one of my in law's recipe and hence decided to do Kothavarangai/Cluster beans/Indian beans Poriyal. Cut the cluster beans and wash them. In a pan, add oil, mustard seeds. When the seeds pops, add hing, urad dal, channa dal and curry leaves. Saute them for few seconds. Add the cut cluster beans and some water to cook the beans. Throughout this process do cook in a medium flame. Occasionally stir and see if it requires more water to cook. When you are sure that the beans is cooked, add the groundnut powder and mix well. For the groundnut powder, just grind the raw ground nut or roast the ground nuts and grind them into a fine powder. Either way it adds great flavour to the dish. While cooking the beans, make sure that you do not overcook or add excess water. This may spoil the dish. This is a very tasty bean! Something different than reg beans. Yummy curry, simple yet delicious! Adding peanut powder looks like a good idea. the curry looks so delicous sangeeth! Reg. your recent query: I am already on vacation and I am posting the recipes from my sister's kitchen. Thanks dear! It's been a long time since I made kathavarangai. Also I have never tried it with peanut powder. Wanna try it!! I love this..we call it Gawarfali... we make it differently and it tastes best when cooked fresh...Will try your way sometime..